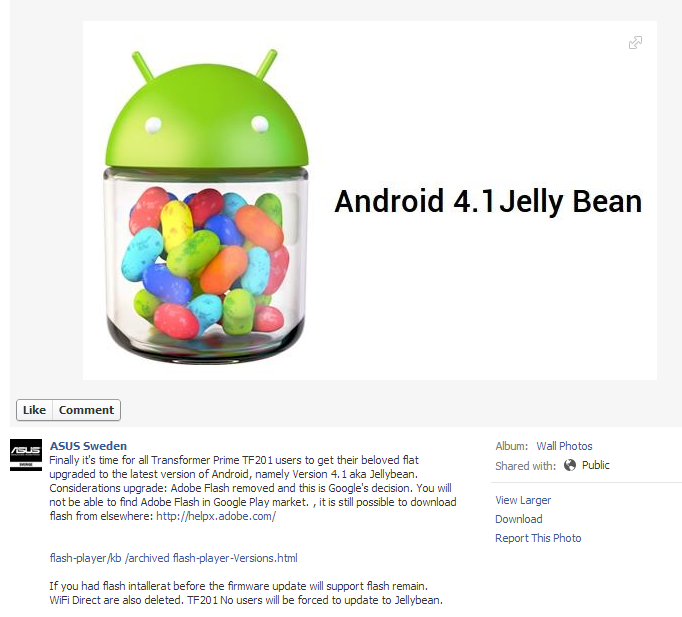 ASUS notes on its Swedish Facebook page that this update will kill flash support in the Play Store, but it also lovingly provides a link to Adobe's site, where the player can still be downloaded. Good Guy ASUS! Otherwise, the OTA will remove Wi-Fi Direct support for whatever reason, so if this is something you use often, you may want to stay on ICS for now. Bummer. As of right now, there's no word when the rest of the world will see the update, but the fact that they're already pushing it elsewhere is a good indicator that it's ready to go. Hopefully we'll start to see it become more widely available in the coming days.